The Capacity Planning Module gives you complete visibility of all your operations throughout the factory, highlighting bottlenecks. This enables you to adjust your resources accordingly to ensure goods are produced to maximum efficiencies and on time. 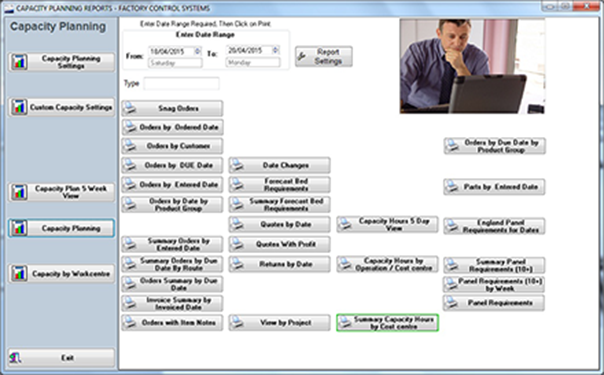 Default capacities can be set for each day and edited as necessary, to suit specific date requirements. Diagrammatical presentations of over / under capacity, are given by percentage, on a daily or weekly basis, against each Work Centre / Operation. These are based on the cycle times for each item, as entered in the Bills of Resources and the capacities set for each Work Centre record. You have the flexibility to run MRP, with or without affecting Capacity Planning. Forward capacities can be temporarily changed or amended, on a daily / weekly basis, from the default settings for each Work Centre. This allows you to carry out as many 'What if?' scenarios as you require, to help in balancing operations and processes. 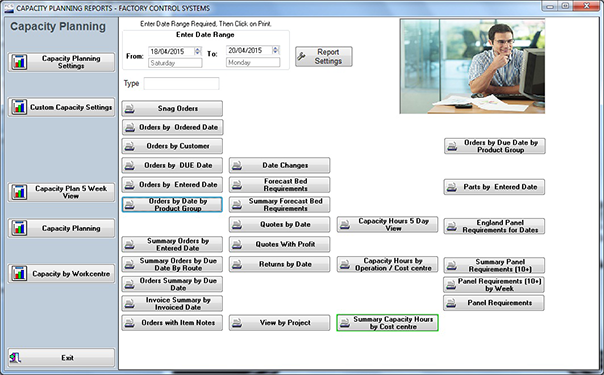 The Manufacturing Resource Planning Module allows you to calculate material and labour requirements for orders, taking into account physical stock, existing settings for minimum stock levels and economic order quantities, (based on rules set by users). Works and Purchase Order requirements are created, taking into account order dates and predefined operational offset. This can be done for individual orders as well as the full order bank. A 'suite' of reports show suggested Purchase and Works Order requirements by: unique project number, date and item, along with their stock records. Orders resulting from these can be automatically created on the system, through the push of a button, ready for printing and processing.